That’s all the egg protein it took to induce an allergic reaction in my eldest son. It wasn’t anaphylactic at that level and was controlled with antihistamines, but I can’t help but shake the feeling that this is very allergic. 21 milligrams. That’s 3/1000ths of an egg, folks! 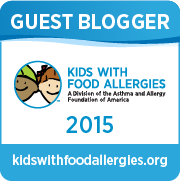 Not many people know a specific threshold for themselves or their allergic little ones. The reason we found this out was because of a research study. 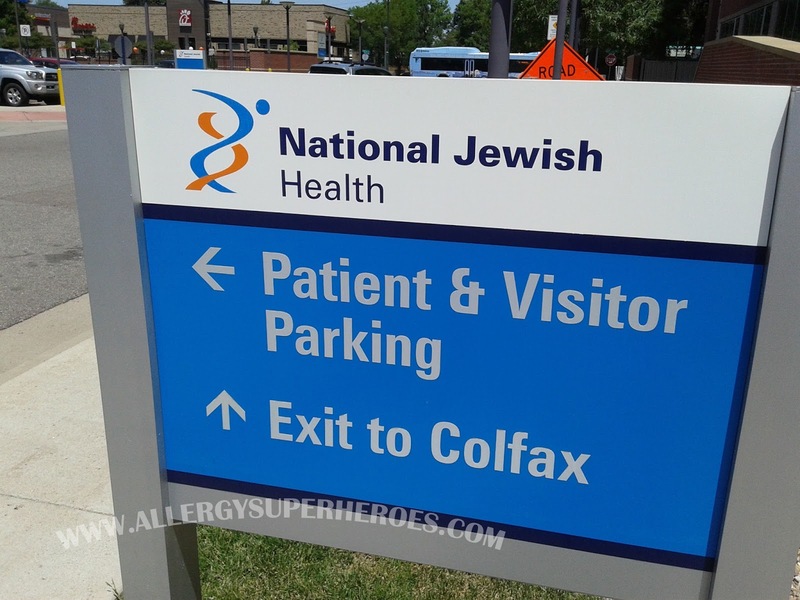 We enrolled Zax in a study at National Jewish Health in Denver to study a new blood test for food allergies. From what I understand, the hope is that the new blood test will not only be more accurate, but may also predict severity. It was an interesting process. 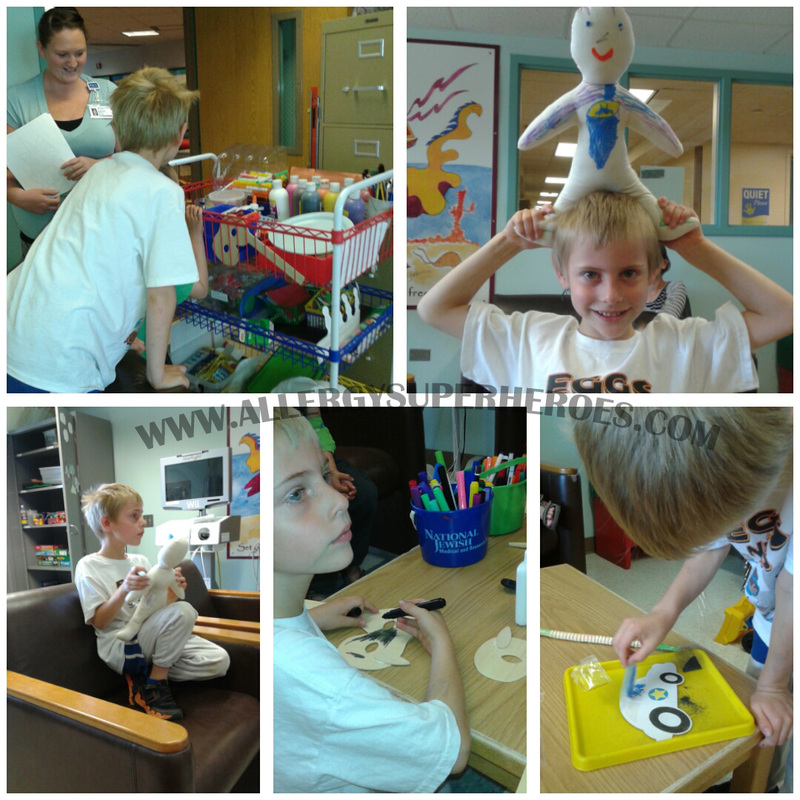 The first day was a screening visit to make sure he was eligible, get his specific numbers, and take blood samples. They were specifically studying egg, milk, and peanut, and Zax is allergic to two of the three. We started out by putting a numbing cream on his arm (which takes a while to take effect) and then we talked a lot. They took a medical history and did a scratch test for egg and peanut. I liked the way they recorded the numbers from the scratch test–they traced around his reaction with a fine-tip sharpie, then took a piece of packing tape, placed it over his reaction, pulled it off, and then they had an exact copy of the size and shape of his reaction. Very nice way to remember exactly how things went when they come back to his chart months from now. His histamine control reacted, as it was supposed to, and so did peanut, but egg failed to show up. Suspecting that something was wrong, though, the doc reapplied the egg prick and reset his timer. No such luck, egg popped up after all. I almost got my hopes up here, but not too much. 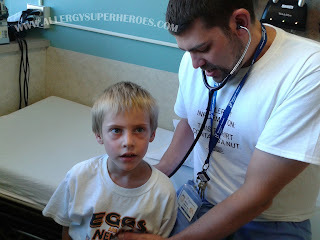 I, too, suspected that something was wrong with the test and didn’t really think his egg allergy had just disappeared. We were there for the egg, after all. They had met their study quota for peanut participants prior to our learning of the study. We first thought we could be grandfathered in since we were already in the study for egg, but later found out that doing peanut wasn’t possible. After the skin test was complete, they did a blood draw. Despite the EMLA cream, Zax said it still hurt. Poor boy. A previous blood draw had gone fine, but this one was uncomfortable in some way. He was brave anyway! 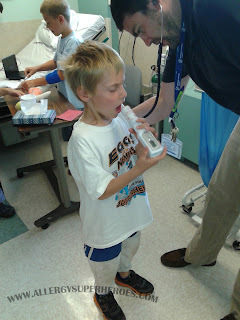 They took his vitals too, and did pulmonary function tests so they would have a baseline for later. After his initial screening Zax did two double-blind food challenges. In both cases he ate applesauce seasoned with cinnamon and spiked with either egg protein powder or oat powder (placebo.) Neither we nor the staff knew which day was which until he reacted. For each day, we were scheduled for about 5 hours. The doses took 3 hours to administer (assuming he got through them all) and then we would hang out for a 2 hour waiting/observation period. 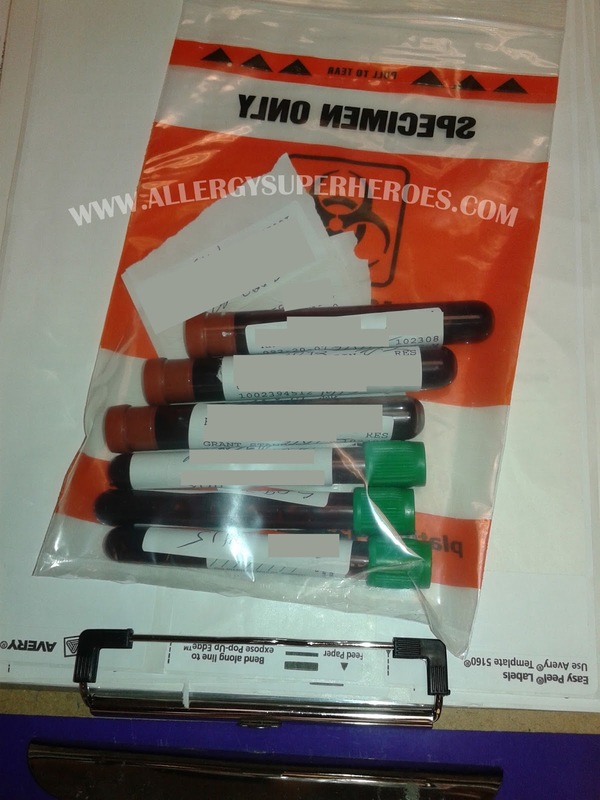 If, on the other hand, Zax reacted, we would wait for observation for 2 hours following a reaction requiring Benadryl and 4-6 hours following a reaction requiring epinephrine. So 5 hours was more of a ballpark, it could be as few as 3 or as many as 7-8, depending on reactions, severity, and how far into the challenge he got before reacting. We started the day by getting his vitals again (and he took kitty’s vitals) and then the eating began! I had explained what we were doing to Zax beforehand, several times, but we went over it again after his first dose. He wanted to know why we were coming twice so I attempted to explain the purpose of a placebo to a six-year-old. The moment I told him that it protects against him getting worried and thinking he feels a reaction when he doesn’t, he pointed to his throat and said it felt a little funny. We reported that to the doctor, who suggested that he take a sip of water to see if it goes away. He did, and then buried himself in crafts, and nothing further came of it. Apparently describing the placebo effect is enough to cause a placebo effect. 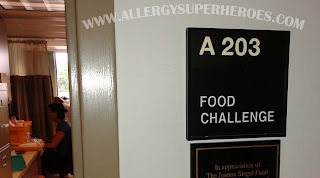 There were two other boys in the the Food Challenge room (with their mothers and doctors) because the room was shared. Zax enjoyed playing with the younger of the two, who was challenging peanut for the same study Zax was in. The third boy was doing his one-year challenge for a peanut patch study–and he was getting near-constant attention from the staff. Both of the boys challenging peanut had an IV hookup in their arms so they’d be ready to administer steroids or fluids if necessary, which is hospital procedure for peanut challenge. Before each new dose, the doctor and nurse checked Zax over, listened to his lungs, had him perform a Peak Flow test, and asked him how he felt and if he had any itchy spots. After about 8 doses, I started doing math. I’m a numbers person, so I naturally gravitate towards them. I copied down all the doses, added up what Zax had eaten so far, calculated how much egg had been required for Zax to react previously, and thought about what all of that meant. You see, Zax did a baked egg challenge before starting preschool, which he failed. I’d been told at the time to bake something containing 2 eggs, baked at 350 degrees for 30 minutes, and to bring in 1/12th of it. The nurse then cut the brownie I provided into four equal parts, and we fed them to Zax at 15 minute intervals. Zax felt a little funny after eating the first quarter (1/24th of an egg) but didn’t report it because he wanted more chocolate. He no longer wanted any brownie after his second piece (1/12th of an egg cumulative.) If an egg is 6-7,000mg of protein, that meant that he’d started reacting at no more than 291mg, and he called the test quits at 583mg. At the time that I started calculating all of this, he had eaten 996mg of something–egg protein or placebo. I began hoping very fervently that day 2 was egg, because if it was, that would be a very good sign! He kept eating each successive dose without issue, however, and after he ate a combined dose of more than half an egg (if it was real) I came to the conclusion that he’d been eating placebo. Zax loved the applesauce and eagerly scarfed down each dose without any issues. The room was fairly noisy and boistrous, and it became apparent after a while that all three of the kids were taking placebos that day. 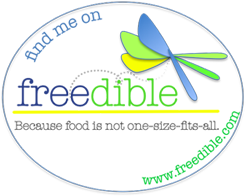 A random assignment to be sure, but it was nice to have everybody on the same page. There was no eating during the test (except for the study doses), but after all doses were taken Zax was allowed to snack on foods that are safe for him. 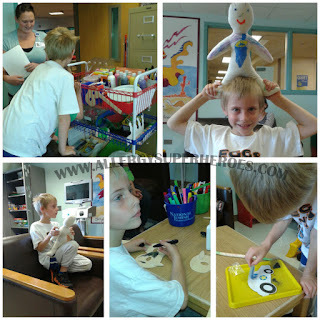 He did so, and we waited out our observation period with more crafts, games, and movies. I didn’t tell Zax that I was certain what he’d eaten was the oat powder. 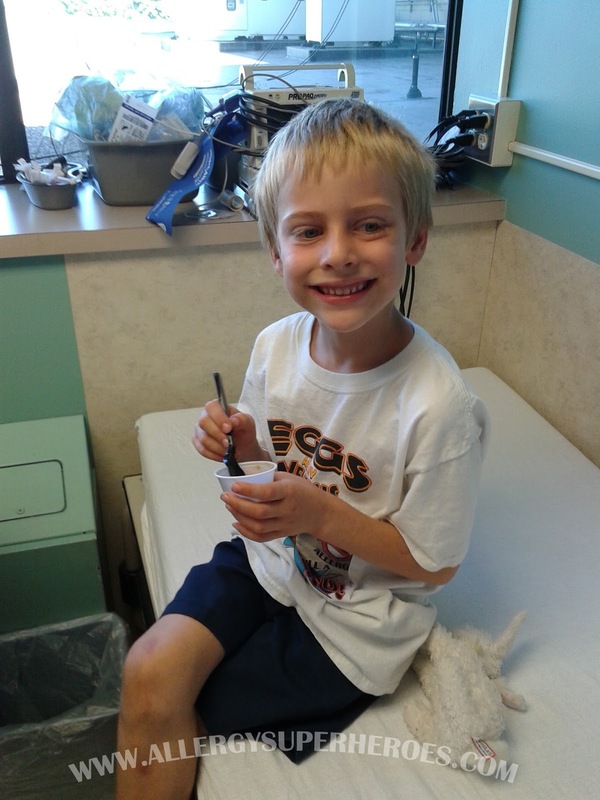 I told him that either it was the placebo or he’d outgrown his egg allergy. He’d approached the challenge with such confidence and enthusiasm that I didn’t want to damper that with the expectation that he would definitely react at the next challenge, even though that was fully what I was expecting. You may have noticed that Zax was wearing his “Eggs are my Nemesis” shirt for the challenges. It seemed fitting. 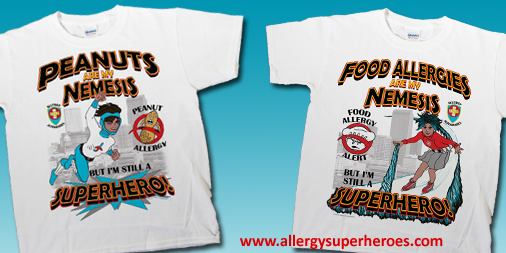 Check out our website for gear like this to protect your little allergic superheroes! Zax’s second challenge was four days after his first. I reiterated to him that nothing might happen that day, although when taking his first dose he told the nurse he expected it had egg in it. 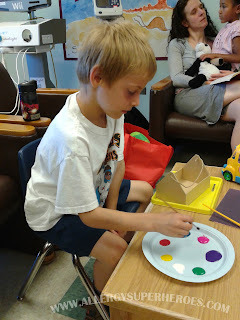 There was one other boy doing our study that day, accompanied by his mom and sister (who had no allergies.) The two did not get along as well, so they did not play together much, although they watched TV together. Zax selected a craft to do and got down to work. He didn’t get very far, though, because a few minutes after his third dose he told me that his throat felt funny, kind of achy/itchy. We reported this to the doctor and nurse right away. They took his peak flow, listened to him, and asked him questions. Then, just like the previous day, they asked him to take a sip of water to see if it would make it go away. 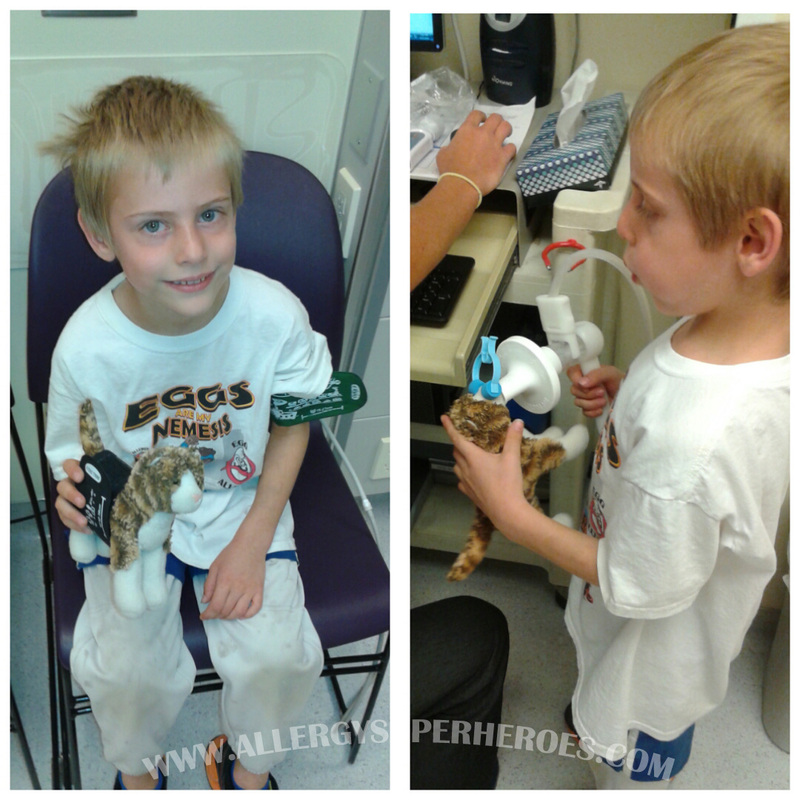 Then they told me that they’d wait a bit longer and see how he’s doing before deciding if they’d do the next dose. After maybe 10-15 extra minutes he said his throat felt mostly better so they gave him his next dose, another 50mg, bringing him to 71 total. I felt certain that the challenge would end there, but after another 15 minutes he said it still felt about the same–not totally gone, but no worse than before. So they gave him dose number five, 75mg, which brought him up to 146mg total. Just a few minutes after that dose, he said his throat felt worse again, and worse than before. While he’d been hesitant and wanted me to report his symptoms to the doctors previously, this time he boldly told them himself, and announced that he didn’t think he should eat any more. 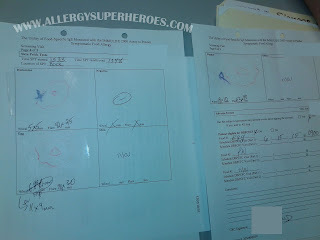 They checked him over and still didn’t see much in the way of physical symptoms except possibly more stuffiness in his nose (he’d already been stuffy from seasonal allergies because he couldn’t take antihistamines prior to the challenges) but everybody agreed that he should stop. I know what they were doing when they pushed him to five doses from three. My kid had experienced a mild placebo effect on the first day, on the first dose, and as part of their study procedure they have to make sure that a patient is actually experiencing a reaction and not just a tickle in their throat or a placebo reaction. I do get that. But since the feelings never completely went away and then returned more strongly after the next few doses, there’s no doubt in my mind that he was feeling a reaction on dose 3, after eating a cumulative 21 lousy milligrams. No doubt. And if he’s going to react to 3/1000ths of an egg, I don’t feel like he’s going to grow out of this anytime soon. 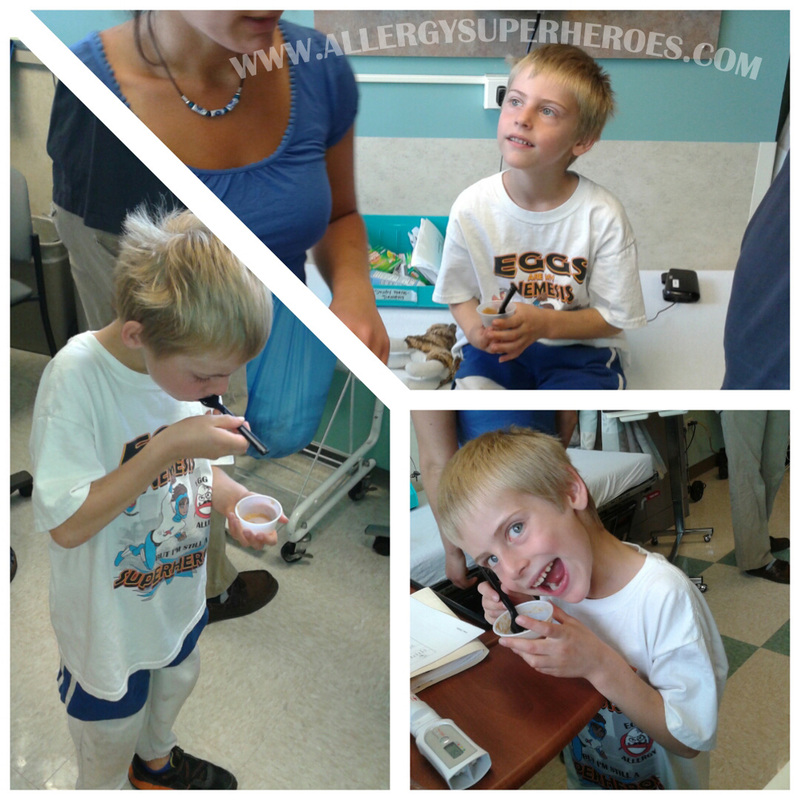 We gave him a meltaway Zyrtec, which greatly surprised me. When the doc suggested it over Benadryl because it wouldn’t make him sleepy, I couldn’t help but grill him. Is it really as effective? 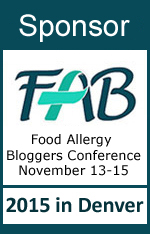 I’d never considered or even heard of using a once-daily antihistamine in place of Benadryl. He said it hasn’t been rigorously studied but from what they’ve seen, liquid or quick-dissolving Zrytec (and possibly Allegra) works as well as Benadryl for mild reactions. Zax was already starting to get drowsy from the reaction, so I decided to give it a shot rather than give him a drug that would make him even more tired. After about 40 minutes Zax reported that he felt all the way better, but a few minutes later he gulped a bit and said he might throw up. He didn’t, but he sat with the throw-up bucket nearby while staring mindlessly at the TV for another half hour or so. Once he started to perk up, I broke out the consolation prize–a new Lego set. We even found a better use for the throw up bin! I realized after the fact that I’d been taking pictures through the whole procedure, but I hardly took any while Zax was reacting. Too preoccupied with my child’s welfare to think of the camera. For a while he looked really run-down, with bloodshot eyes and circles under them. Once all of that cleared and his behavior perked back to a semblance of normal, I knew he was feeling better. By the time we left, Zax was basically himself but still a little worn out. It’s rough to have an allergic reaction, even if it isn’t anaphylactic. Especially if you ate more than you probably should have. He was tired all afternoon and didn’t have his normal energy level again until the next morning. I’m happy to report that the next morning wasn’t at all affected by the reaction, and he played soccer without a hitch. We had Epis on hand as per doctors orders (which we always do anyway) in the time following the challenge just in case of a biphasic reaction, but fortunately he was fine. 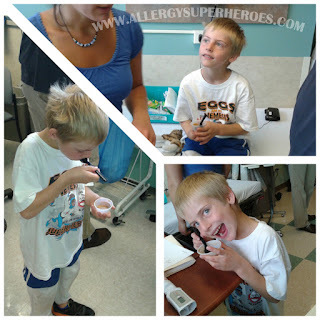 It was weird intentionally inducing an allergic reaction in my son. 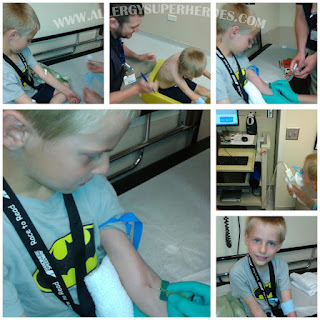 I was never scared for his life–after all, there’s no safer place to have an allergic reaction than in a hospital surrounded by doctors who do this all the time–but I was worried about him, especially going into Day 3. Even though there had always been a chance that he’d react to the first challenge, it somehow felt worse the second time, and probably because I knew that something was going to happen that day. I was doing my best not to pass anticipation or anxiety on to him, and I think I succeeded, but that doesn’t mean it was easy. I am glad, however, that we’re contributing to the advancement of food allergy science. This new blood test may someday replace RAST testing, or it may fizzle and die off, but we’re helping determine if it works, and that’s a worthwhile achievement. There was one silver lining to Zax’s reaction, other than the obvious contribution to medical science. 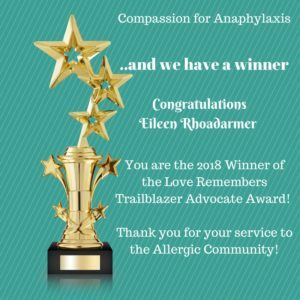 I quiz him regularly on what he’s supposed to do during an allergic reaction, and I introduce different scenarios for him to think through. 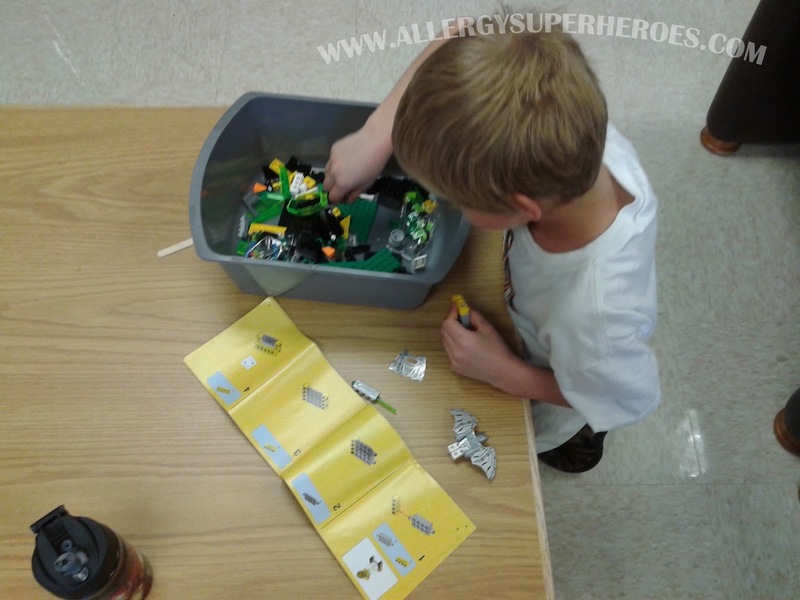 A few months before this study, I asked him if he remembered what an allergic reaction felt like and he said no, not really. Then he suggested that maybe he should try something he’s allergic to again so he can remember. I am a fan of knowing what you’re dealing with. When I first read the story of B.J. Hom’s death, I couldn’t get past the detail that he asked his father for cough drops because his throat hurt. He didn’t know he was having an allergic reaction, and so neither did anyone else in his family. I was stunned than anyone with food allergies could make it to the age of 18 without knowing what an allergic reaction felt like–because my own childhood was riddled with accidental exposures that, among other things, didn’t allow me to forget that telltale sensation. 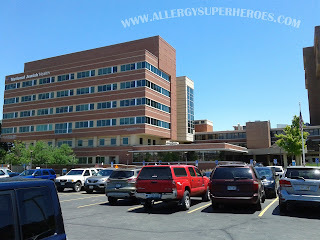 So the fact that someone could die of an allergic reaction because they didn’t even recognize what was happening scared me. A lot. It scared me so much that it has colored the way I parent. 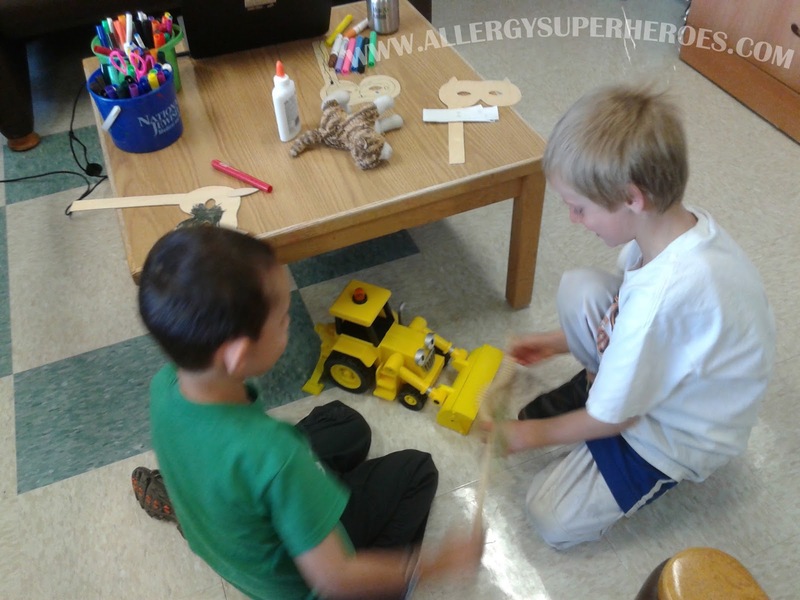 Every time one of my kids has had an allergic reaction, I’ve asked them to think carefully about how they feel and to remember it, and if they ever feel that way again, they’re to tell an adult right away. 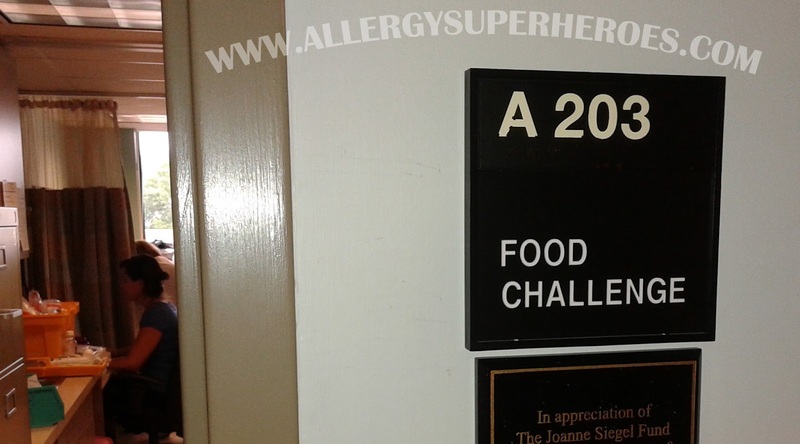 Because really, none of the words we use to describe an allergic reaction quite does it justice. They’re close, and good guides to be sure, but it’s a unique feeling that lacks an appropriate descriptor. 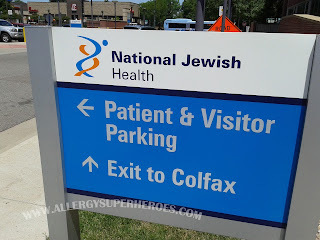 So there was Zax, at the wise old age of 6, admitting that he didn’t remember an allergic reaction (it had been a few years) and suggesting that he needed a reminder. This study certainly gave him that reminder, and there was no safer place to do it. And if that experience can keep my child safer, then it was time well spent. Thank you for an important post and an important contribution.